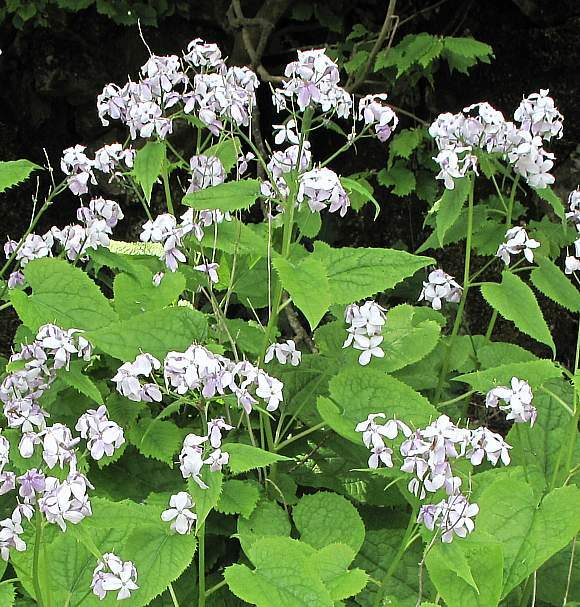 A perennial garden plant which hardly ever escapes by itself into the wild. It is usually planted. 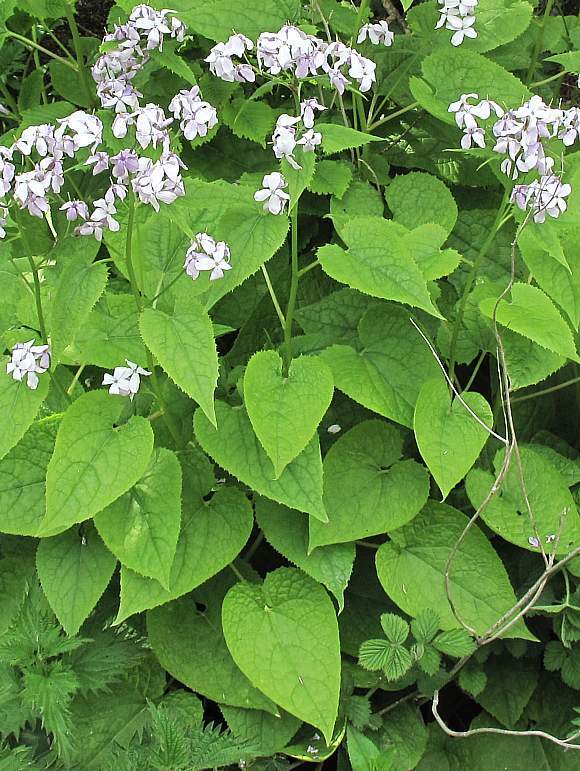 Unlike Annual Honesty it has cordate (Ace-of-Spades shaped) leaves which are on stalks. 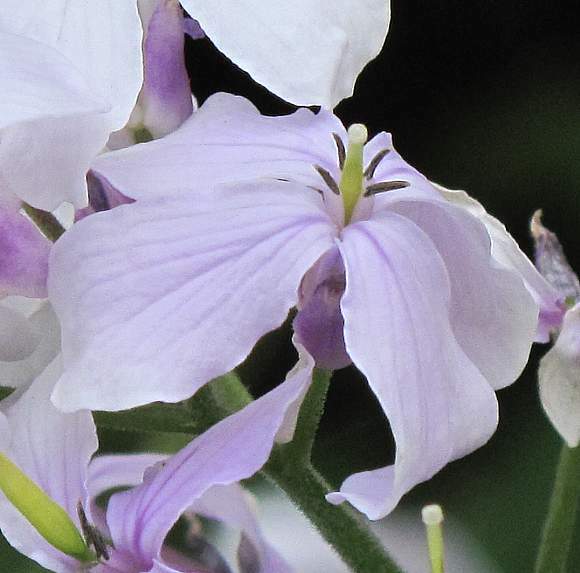 The flowers are much the same as those of Annual Honesty, but the fruits are remarkably different. 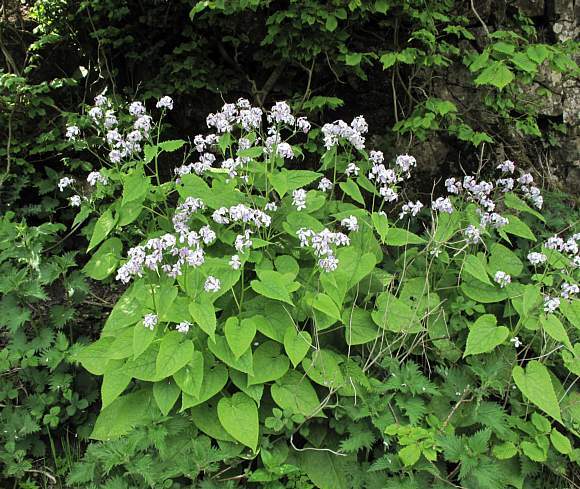 These two leaves near the top are more spear-shaped than cordate, narrower, and with longer cusped teeth. Four floppy white to pink/lilac petals and a seed pod growing out of the centre. These seed pods are nowhere near fully grown. Short stubbly hairs on the stems, angled downwards. 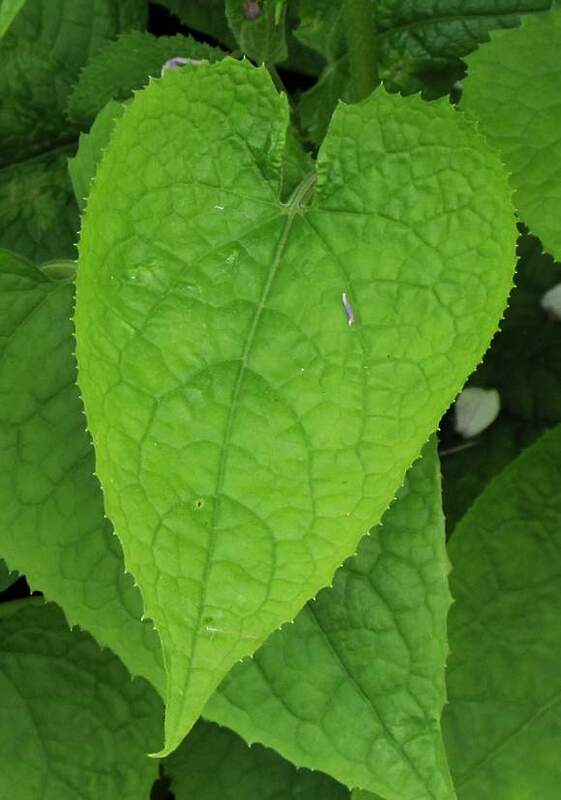 The leaves have winged stems. Teeth on leaves are cusped. A very immature seed pod still has a long way to grow. Seed pod starting to take shape, but still very small and under-developed. 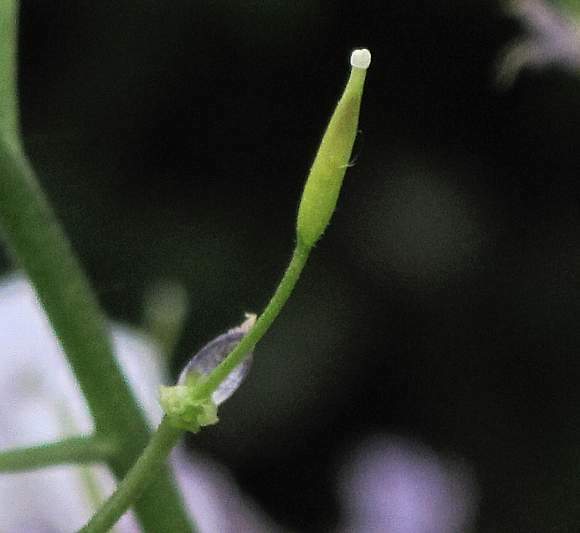 It is on a long stalk coming from the ovary of the flower (a petal is still attached to it). The seed pods later widen and lengthen to form a large flattened oval shape similar to a Privet leaf in shape if not colour. The cusped teeth and the winged stem of the leaf. 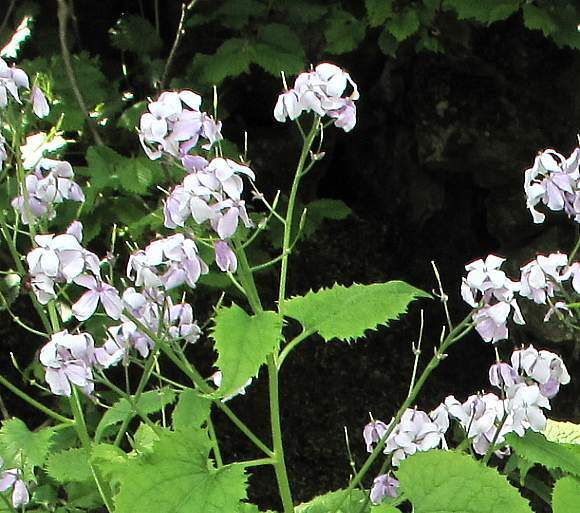 Some similarities to : Honesty (Lunaria annua) but that has pinker flowers, leaves without stalks (on the upper part only) and the seed pods are more like ping-pong bats. 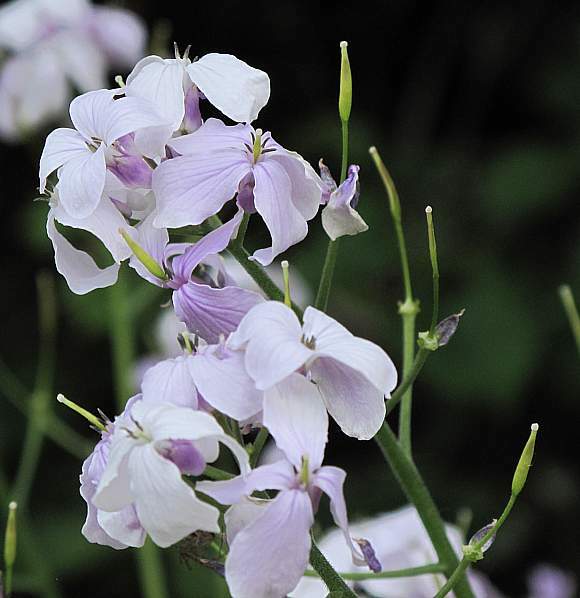 Slight resemblance to (the flowers of) : Cuckooflower (Cardamine pratensis). 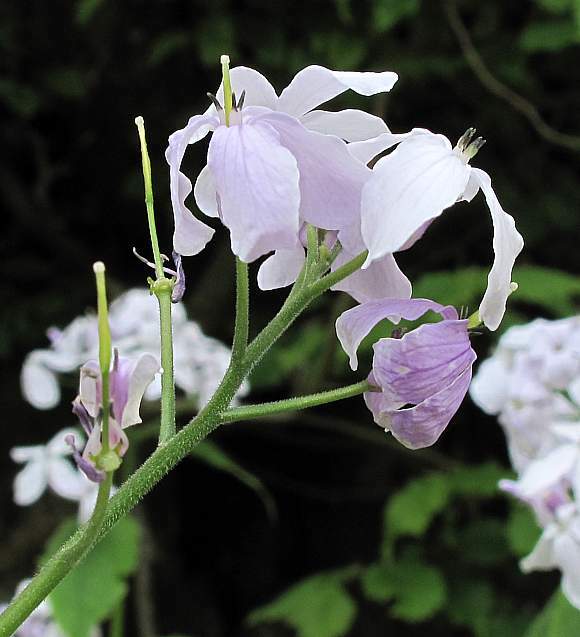 Superficial resemblance to : Dame's-Violet (Hesperis matronalis) which have either pink, or white flowers on separate plants, but the pods of Dame's-Violet are slightly different, being thin and cylindrical rather than flattened oval/elliptical, and the leaves are both stalkless and lanceolate. 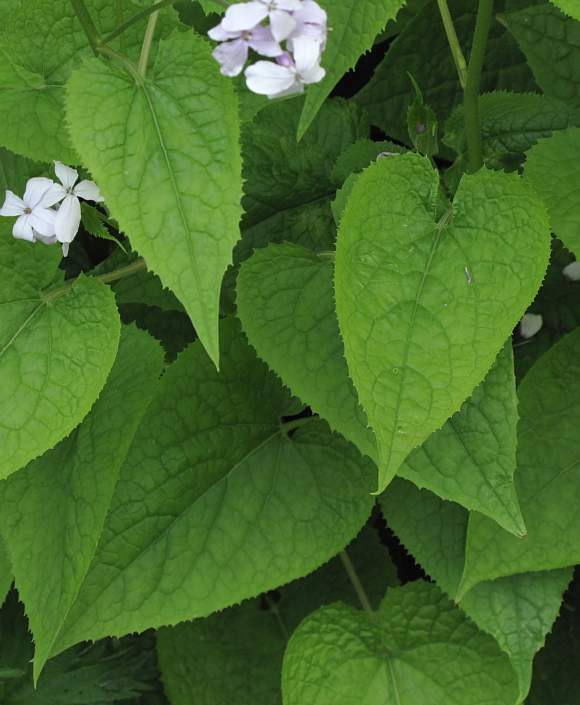 It is a perennial plant growing to 1m or more grown in gardens. It very rarely escapes into the wild as a casual, if at all, and is usually planted. The BSBI map does show a square where your Author found this, and one or two other squares in the UK. 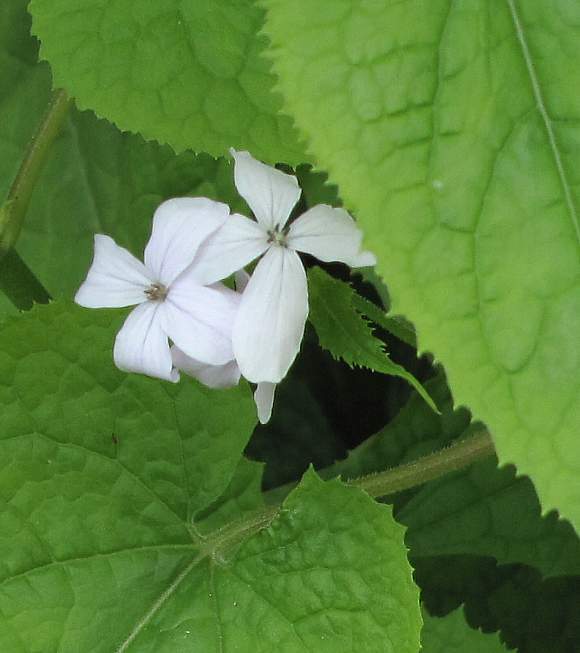 It grows in damp woods and on lime soils.